Though they may be doing their best not to think about it during this last full month of summer, some 55 million children and teens — and more than 20 million college students — are going to be heading back to school in the coming weeks. Taken together, that means about 77 million new and returning students. 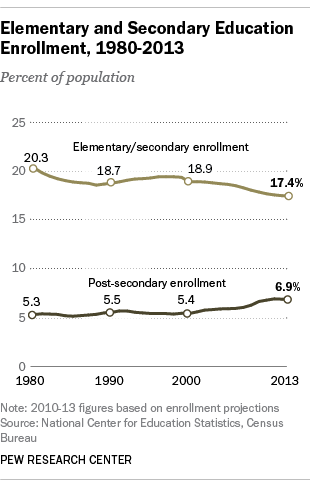 After the Baby Boom-era peak of 1971, enrollment in the nation’s elementary and secondary schools declined steadily until the mid-1980s, when it began rising again. The most recent peak was the 2006-07 academic year, when 55.3 million American kids were enrolled from pre-kindergarten through 12th grade, according to the National Center for Education Statistics. Enrollment slipped a bit in subsequent years, but the center’s projections show it on the rise again. The overwhelming majority of elementary and secondary students will attend public schools, whose share of the total student population has grown modestly over the past three decades. Public schools enrolled 87.3% of U.S. elementary and secondary students in 1983, but the center projects that 90.5% of elementary and secondary students will attend public schools this fall. The private-school share, conversely, has fallen from 12.7% to 9.5%. While the absolute number of U.S. elementary and secondary students seems to be on the rise, they’re making up a smaller and smaller share of the overall population: 17.4% this year, by our calculation, versus 19.4% as recently as 1999. But postsecondary students are increasing both in absolute and percentage terms: from 12.5 million (5.3% of the population) three decades ago to a projected 21.9 million (6.9%) this year. That trend is driven both by the aging population (kids who seemingly only yesterday were in first grade now entering college) and by adults continuing in, or returning to, higher education to retrain or refresh their skills. In fact, Americans are attaining educational credentials at a record pace, according to a 2012 Pew Research Center analysis of Census data: In 2012, for the first time ever, a third of U.S. 25- to 29-year-olds had completed at least a bachelor’s degree; another 30% had college experience short of a bachelor’s, and nine in 10 had high-school diplomas.